Geek Grotto - Get Your Geek On! 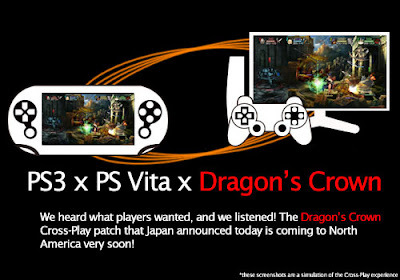 : Dragon's Crown Getting Cross-Play In The US As Well! Dragon's Crown Getting Cross-Play In The US As Well! Well, now this is good news. The recently announce Cross-Play patch announced in Japan for Dragon's Crown will hit the US sooner than later. Very Soon in fact. No work on the EU getting it yet, but NIS and Atlus do have a great working relationship, so I think our friends across the pond should be covered. Also.... Dragon's Crown is on sale for $10 off MSRP. So it's a great time to jump in!